When a Chaminade High School student packs his backpack for a day of learning at Chaminade High School, he is sure to remember his notebooks, folders, pens, pencils, and textbooks. But for the freshman Class of 2019, they will also have to pack their new school-issued Apple iPad. 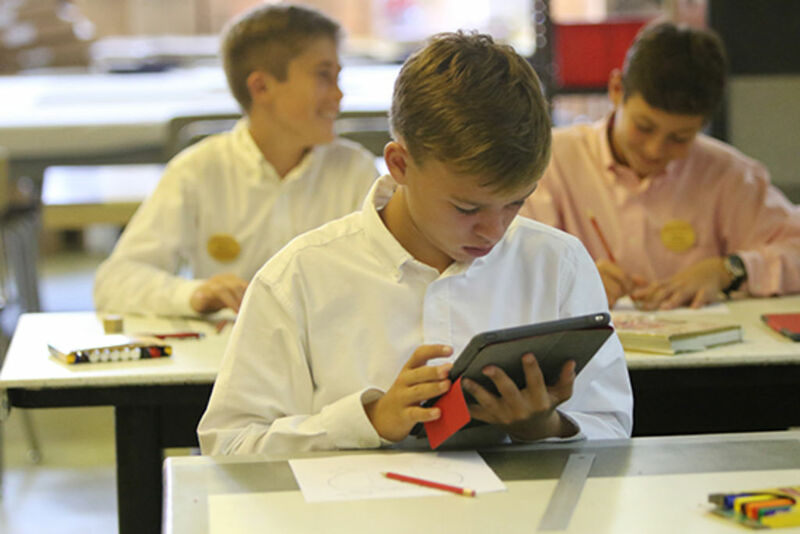 Chaminade High School’s most recent technological update has included the incorporation of iPads into the freshman curriculum. This change, one of the largest improvements in Chaminade’s history, updates the way a Chaminade student participates in class. He will go from writing on paper with pencil to typing and writing with a stylus on applications such as Canvas and Notability. A Senior Leader helps a new freshman with his iPad during 3-C Week. In the final week of August, members of the freshman class spent one of their afternoons in the Activity-Athletic Center where they received, set up, and learned how to navigate their brand new, gold-backed, 64 Gigabyte, Apple iPad Air 2. Although freshman students received the iPad’s on the first day of orientation, the upgrade process began before the students even walked through the door, for they were required to make an Apple ID, or an “@icloud.com” email and password combination, to back-up their files to different programs through the use of the cloud. Canvas, Chaminade’s new Learning Management System (L.M.S.) which provides the backbone of the new educational framework, brings together all of a student’s classes online. It serves as a one-stop shop for anything curricular or extracurricular at Chaminade. Canvas simplifies the academic process and brings a student’s responsibilities and workload online. Although the Class of 2019 can use the Canvas app on their iPads, all grades of Chaminade are integrating Canvas into the curriculum via an accessible online login. In another show of impressive technological advancement, Canvas is able to take any uploaded file or image and transfer it to one of Chaminade’s core educational applications, Notability. A freshman studies his iPad to find his assignment on Canvas. Notability, now commonly known as “the freshmen notebook,” is the interactive digital document-based component to the iPad initiative which eliminates all “paper and pen” academics pursuits. A teacher or student can share a file with an entire class, and each student can write, highlight, or edit work in his own desired way, all with the touch of a stylus. Although this movement has only recently been set into motion, the freshman class has been off to a great start during the first few weeks of school. The Chaminade family has anticipated this moment for the past year and expects a positive response for the new program throughout this year. Posted in News and tagged canvas, freshman, ipad, notability. Bookmark the permalink.